“Doctor Who has been many things – epic, scary, life-affirming, naff – but up to this point, not many would have called it especially cool. Stay with me … Class is familiar territory seen through new eyes. We are talking about a youth-oriented spinoff from a children’s show that grown adults enjoy getting angry about online, and that comes with a built-in warning that its adult themes make it ‘unsuitable for younger viewers’. Certainly, there are swears aplenty. One of the leads even smokes. And it doesn’t flinch from being gruesome. Such is the way with YA. But if Class carries itself with swagger and style, the young characters themselves don’t necessarily – yet.” — The Guardian. “The lead characters are the usual group of misfits that you get in a teenage sci-fi series. There’s the highly intelligent one with a controlling mother, the cool sporty jock, the sweet shy girl and the new kid, now forced to work together to save the world (the fabric of time and space in the school has worn rather thin from overuse, resulting in a tear that can allow in nasty monsters). But here, mercifully, more nuanced, detailed characterisation means that you soon forget about the stereotyping.” — The Telegraph. 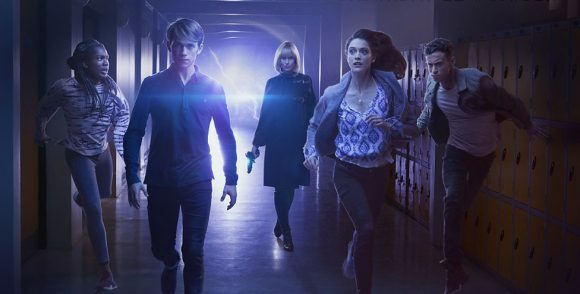 “As Doctor Who and genre fans, despite being well past our teenage years, we can see there is plenty to love at the new Coal Hill Academy. It is early days, but Class comes across as fast, funny and at times a touch frightening – we hope that proves to be a winning combination.” — Cultbox. “Right now, Class is a bit like a hormonal teen – all over the place, with quite literal moodswings. But also like a teen, it’s finding itself. The biggest takeaway from these two episodes is that we could be in for something really quite special here, once it gets over the growing pains.” — Digital Spy. “Class will be a reminder of how many people felt about Torchwood when it first began – that it couldn’t measure up to its parent series. Doctor Who is a show that’s evolved slowly over more than half a century, and as many TV programmes have learned to their cost, it’s a difficult thing to reverse-engineer. Arguably Torchwood never quite managed it in easier circumstances, so who’s to say Class will do any better?” — Radio Times. Watched the first episode of Class and it was very good.